Whilst the AX.25 packet networks of yore have all but died, the protocol is currently used with APRS, and so the related issues remain relevant… well as relevant as APRS remains. This modulation is most commonly used with quite standard narrowband FM radios intended for voice use, and hams have used radios made for the commercial land mobile application, and compatible radios manufactured specifically for the ham market (eg Yaesu, Kenwood, Icom etc). These NB FM radios use pre/de-emphasis over the entire voice band. The transmit audio is passed through a single pole RC filter with a time constant of around 1ms, which gives the filter a +3dB point at around 150Hz, so audio can be thought of as pre-emphasised at 6dB/octave with increasing frequency from 150Hz. There is a complementary de-emphasis network in compatible receivers. 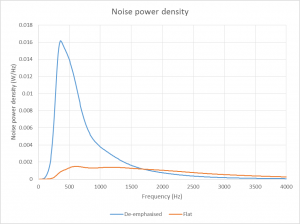 Pre-emphasis and de-emphasis must be used in together or not at all, to do otherwise presents the demodulator with a signal with excessive twist which it cannot demodulate (no matter how strong the signal). 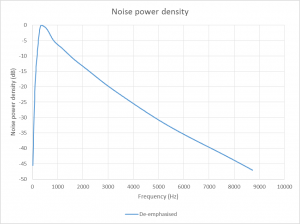 Above is a chart of the measured noise power density of the audio output from an IC-2200H. The de-emphasis network dominates the response. Using pre-emphasis on the transmitter affects the bandwidth, but the effects are small and insignificant in the ham application. 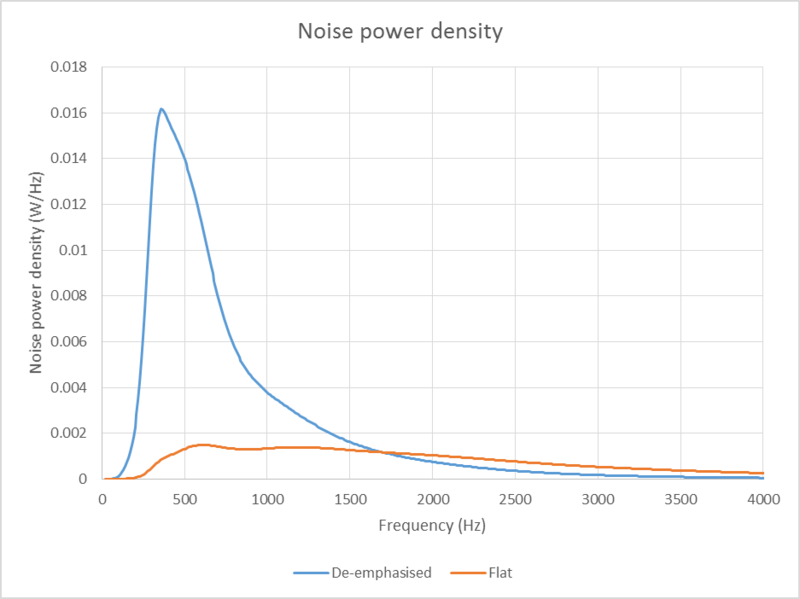 Above is the same receiver output noise power density plotted in W/Hz (blue) and with the de-emphasis backed out (orange) and normalised to gain at 1700Hz, the nominal carrier for 1200Bd AFSK. 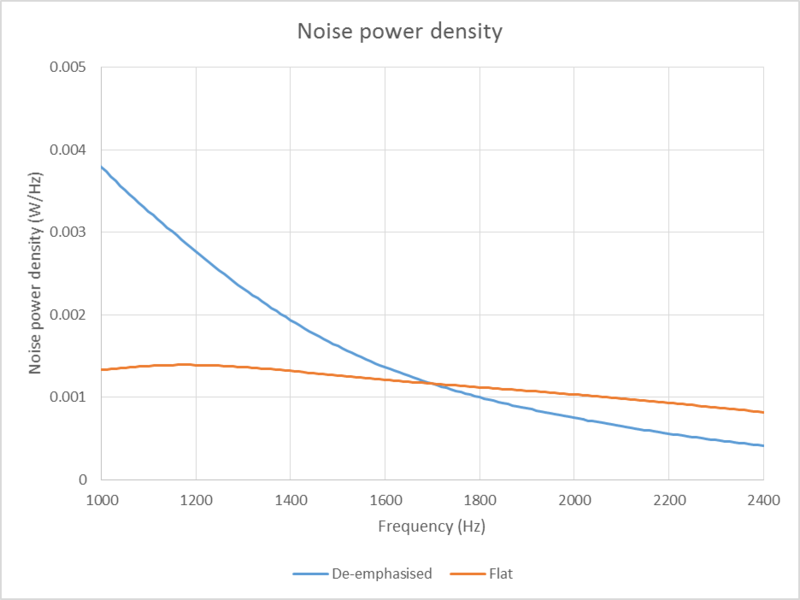 The total noise power under the non de-emphasised curve is almost 5dB lower than for the de-emphasised case. 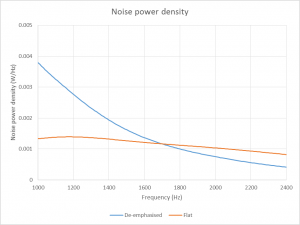 Most modem chips incorporate a bandpass filter in the receiver, and the noise performance from 1000-2400Hz is more relevant. Above zooms in on the noise admitted by a 1000-2400Hz bandpass filter in the modem chip. 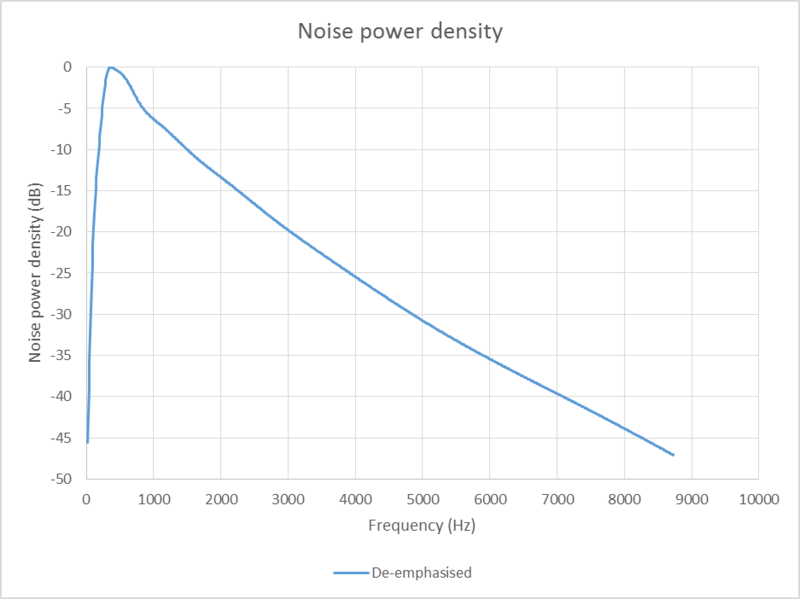 The total noise power in the de-emphasised response is about 1dB higher than the non-de-emphasised case. There is very little receiver advantage to bypassing pre/de-emphasis in tx and rx. The advantage in using pre/de-emphasis in tx and rx is simply that unmodified FM voice radios can be used to carry 1200Bd AFSK modulation applied to the microphone input and taken from the speaker output, or equivalents. As discussed at The extent to which APRS works is often an accident, overdrive of transmitters to the point where the limiter clips modulation defeats pre-emphasis and it is the most common for incorrectly pre-emphasised signals. Some manufacturers decided to go their own way, Kenwood has manufactured some radios which do not use pre-emphasis (eg TS2000), and though some see them as a leader in the field of APRS integration with radios, they probably make this mistake consistently. Some misguided hams have devised a path through the mess of over driven transmitters and implemented schemes bypassing de-emphasis to accommodate badly configured transmitters, but at the expense of performance on correctly configured transmitters… go figure!